Indian folklore interests me and the tale of how fire was first brought to living creatures is appealing. 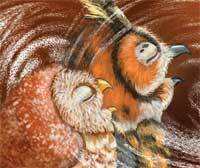 Told as a tale by Cherokee people, First Fire: A Cherokee Folktale illustrates snakes, birds, spiders, and owls as they all try to bring the first fire to their habitat. It also explains, in theory, why some animals have the markings that they do. The 'For Creative Minds' section in the back of the book covers three subjects - Cherokee people, fires, and water spiders. 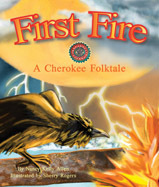 First Fire: A Cherokee Folktale is a Spring 2014 release from Arbordale Publishing. One person will win a book copy of First Fire: A Cherokee Folktale. Yes, folktales interest me and I love introducing them to my grandsons! I find them interesting and I'd like to share stories like these with my class. I love folktales and folklore...it's so interesting. I love folktales and really enjoyed them as a kid. I'd love to share this with my children. Yes, I love folk tales. And I think my kids would enjoy them. Yes, I like folk tales. Yes, I do enjoy them! they're interesting and old stories :) It's intriguing to see what stories people used to tell. Folktales are fun to tell and to read about. I love folktales & folklore. I would like to see a resurgence in folklore and folktale telling. The two arts should be persevered as a bg part of aou heritage. I love folktales and folklore. Its a great way to learn about different cultures. They do, we have some great books of folklore and legends in different countries and times. Native american folklore is especially interesting. I find folklore very interesting.I try to get folklore books for my 4 kids from many different countries.They really seem to like them. Yes, I've love them since I was a child. I find a lot of them very interesting! yes, they do interest us. Yes I love hearing those types of stories. I enjoy some of them. I find folktales very interesting. Folktales and lore do interest me. I am a librarian and I love folktales.